Today, we’ll be talking about Agile. Agile all the things. Everything from top to bottom. Left to right. Your whole life. We’ll be talking about different ways we’ve found to best use Agile, particularly in the production of this podcast. If you are not yet familiar with the Agile methodology, in short Agile is a time boxed, iterative approach to software delivery that builds software incrementally from the start of the project, instead of trying to deliver it all at once near the end. It works by breaking projects down into little bits of user functionality called user stories, prioritizing them, and then continuously delivering them in short two week cycle called iterations. The Agile process has been used continuously improve our podcast over the past year, and in this episode, we’ll be discussing the different ways this methodology can be applied. Whether that’s to your business, to your family dinners, to fights with your girlfriend or even to your fridge. We hear a great example of how the Agile process worked from Jeff Sutherland’s book, Scrum, and the power of using stand up for feedback. We also touch on where this method can go wrong; debate a Teach & Learn on Jira versus Club House and take other enlightening topic detours to Bobby’s back tats. Find out how the Agile process has helped improve this podcast. 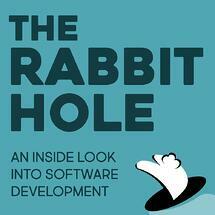 What has been the secret to the success of The Rabbit Hole? Asking for feedback in the retro from guests on the podcast. Plus, minus, delta: The different retro formats and the one we use. Learn more about prime directive, backyard grooming and Bobby’s back tats. Learn more about using stand up for feedback and the Agile family manifesto. Successful examples of the Agile technique from Jeff Sutherland’s book, Scrum. Different work and personal tasks that the Agile technique can be used for. A few reasons why you should think about getting Trello for your fridge. Should Agile be used to document fights with your girlfriend / boyfriend? Why Agile is not always for everybody and where it can go wrong. Teach & Learns: Jira versus Club House, GraphQL and PyCon Italia. [0:00:01.9] MN: Before we begin, we just want to give a quick shout out to Stride. Stride has a monthly meetup called NYC Tech Debates. It is a monthly debate series for NYC’s tech community. If you live in the greater New York City area, stop on by. NYC Tech Debate will be hosting the CTO of meetup.com and the CTO of The New York Times where they discuss how to retain women in technology. You can RSVP at nyctechdebates.com and you can reach out to them @nyctechdebates on Twitter. Enjoy the show. [0:00:44.7] MN: Today, we’ll be talking about Agile. Agile all the things. [0:00:49.7] DA: Everything from top to bottom. [0:00:51.5] MN: Left to right. [0:00:52.3] DA: Your whole life. [0:00:53.5] MN: Your whole life. We’ll be talking about different ways we’ve found to use Agile and I’m really interested in having this conversation. [0:01:02.8] DA: Yeah, I mean, the thing that made me think about it was that it’s our one year anniversary or we’ve kind of passed our one year anniversary of the launch of the podcast, and one of the things that we’ve used a lot to continuously improve our podcast is Agile process. [0:01:21.1] WJ: Particularly retros. We do a retro after every podcast recording and it’s extremely helpful. [0:01:33.2] WJ: Yeah, it’s like sometimes we’re working in the podcast and it’s good to take a break and work on the podcast. [0:01:37.8] MN: Yeah, because I mean, it’s really great to be able to reflect on the good things that happen and the things that we need to work on and the bad things that happen and it’s exceptionally better when we have guests who appear and they, you know, they jump on The Rabbit Hole for the first time and then they have feedback that we normally wouldn’t get because they’re fresh eyes in the process of The Rabbit Hole. [0:02:03.9] DA: Yeah. I think also, that’s been an interesting kind of feedback loop as well because, you know, we are living at, you know, every week, we’ve not missed a week somehow. [0:02:18.2] WJ: That’s the secret to our success is that we – that’s a hard rule, we never miss a week. [0:02:24.0] MN: Yeah, pretty consistent. Consistency is important but the Agile process does allow us to move forward in that direction a lot easier and better. [0:02:35.2] DA: Yeah, also you know, having people who don’t have fresh eyes like you were saying the guest to come in and like, how do you get so uncomfortable with something as weird as having a mic in your face, I think you’re uncomfortable with that really quickly and you know, figuring that out. [0:03:07.8] DA: Yeah, I think retro is a pretty powerful tool, you know, again, for people who aren’t too familiar with retros or different retro formats, we normally do like a plus, minus, delta –something that we thought was positive, something that you thought was negative and something to change. I feel like that has some general applicability to a lot of different scenarios like I definitely considered using retros after arguments in personal relationships and stuff. Applying the parameter active. [0:03:37.5] DA: You know, everyone did the best they could with the knowledge they had at the time. [0:03:40.7] MN: Yeah, all problems can be solved personally with the prime directive in mind. [0:04:21.8] DA: You have Bobby at a pool party and he’s like full tats. [0:04:27.4] MN: Full tats, all over the back. [0:04:31.0] DA: Bronx tats and the prime directive. [0:04:33.6] WJ: Prime directive is, regardless of what we discover, we understand and truly believe that everyone did the best job they could, given what they knew at the time, their skills and abilities, the resources available and the situation at hand. [0:04:44.4] MN: My back is not even big enough to have all of that anyway. [0:04:49.9] DA: Check out episode five, retrospectives if you want to hear more. [0:05:17.4] WJ: Yeah, we have that Trello board, we experimented with different columns, figured out what worked. [0:05:23.0] MN: Yeah, works pretty good. [0:05:24.6] WJ: It’s very helpful as we collaborate with the editing team. [0:05:28.4] DA: Yeah, definitely. I guess in a more general applicability. I’ve also seen things about like, you know, using Agile for your family, like where you have like standups with your kids or like a retro with your kids and like figure out what your feelings were and like talk about it in a constructive way. [0:05:51.7] MN: I think it would be really interesting to have the idea of having a standup with like children because you get like a 10 second update on like how did school go? Usually that’s at the dinner table but if not, then you could do a standup. “Hey, Bobby, get up, give me a stand-up update right now.” Then you’ve got to give an update to your child and your child should know too. [0:06:32.9] WJ: The product release is you leaving the house, do not want you moving back into the basement. [0:06:50.1] MN: The Agile family manifesto. [0:06:52.7] DA: The Agile family manifesto where it’s about like, adapting and experimenting and empowering people to kind of have their own determination of their outcomes and yeah, just kind of building feedback loops. [0:07:32.9] WJ: Yeah, I mean, I think that the idea of taking Agile principles and applying them to other areas aside from software development is an old one. If you look at Jeff Sutherland’s book, Scrum which is kind of the defining work on that particular methodology for Agile. He talks about having a construction team that was doing an extension on his house, use Agile or use Scrum. He would have them do standups and like estimates and you know, the whole nine yards and he said that you know, in his experience, every other house on the block, you know they had these huge overruns in cost for the construction work and his team got it done on time and on budget. [0:08:22.0] WJ: I did probably. [0:08:37.0] WJ: Yeah, he was saying that actually, there were a lot of things that came out. One of the construction workers thought that they needed clocking in the kitchen and they actually didn’t. Because they exposed them and had some process around it, they were able to discover these things before it became wasted time and resources. [0:08:53.4] DA: Time and money. [0:08:54.8] MN: It’s really interesting because then like you, given the situations that the construction workers were dealing with, he was given the opportunity to make whatever flexible changes necessary. Just being nimble about the decisions that happen rather than eating all the costs to make sure that the house is – exactly follows this process or what not. [0:09:32.8] DA: Just following the directions that were given and not really looking for clarification on what’s really required. [0:09:40.4] MN: People over process, that’s it right there. [0:09:43.8] WJ: Yeah, I think my sister told me that she was using Trello and sort of an Agile type process at her company. She’s a journalist so presumably the strike cards presented actual stories. [0:09:59.4] WJ: Very literal stories. [0:10:01.7] MN: I mean, I’ve also heard people use it for like personal tasks that they want to do throughout the weeks kind of like con bon like “I’m working on XY and Z and you know, this stuff is not quite ready yet until I finish these things,” which will then probably help you move forward. [0:10:19.3] DA: Yeah, I’ve been doing like a Quest Board kind of thing where like, there would be like the Quest Board and you’d go out into the field and then you’d like slay the dragon, then add that task to your pile of slayed dragons. Yeah, it’s a lot of overhead. [0:10:35.1] MN: I’m really bad at doing the personal Trello board, I think I have one on Trello where it’s like personal and it’s blank. I think I used it for a couple – I didn’t move it as often then I deleted everything so don’t be like me if you guys have personal Trello board. Keep going, you guys rock, I’m going to try again. [0:10:55.4] DA: Clearly just delete everything. Yeah, I tried to do a con bon for my fridge too. [0:11:05.5] MN: How did that work? [0:11:27.0] WJ: We did stories for individual dishes. So I live in a co-living space, I have a million house mates and you know, we do big house dinners and I remember there was one day – at this point, we’re pretty practiced at it and we kind of get away with less processes – but earlier on, I remember we had a scrum master come in and you know, every recipe was a story and he set up a board and we would move them across the refrigerator as we were preparing the meal. [0:11:56.2] MN: Would you estimate? [0:11:57.8] WJ: No, we didn’t have time to estimate. We actually were half way through cooking when we were like, “Oh my god, we need some process. Somebody put together a score board”. [0:12:07.0] DA: Coordinating a lot of food. [0:12:09.1] WJ: Yeah there were 20 dishes that we were preparing. [0:12:11.2] DA: Oh okay, wow. That’s an epic. [0:12:13.6] MN: That is an epic, the dinner is the epic yeah. I do like the idea of the Trello for your fridge because often times I don’t know what’s in the fridge and I forget. That technology hasn’t gotten into my house yet where I know I can look at an app and see, “Oh there’s some kale and some chicken stock and some beef,” like I don’t know if I can make something with that or buy something or whatnot. [0:12:40.1] DA: I do have friend who got a smart fridge recently and that would be crazy if you actually could just use Trello on your fridge, for your fridge. [0:12:48.5] MN: Trello on your fridge for your fridge. [0:12:52.1] WJ: Does that smart fridge have an ST gang? [0:12:54.2] DA: I don’t know, yeah we should check it out. [0:12:57.8] WJ: Pack your fridge. [0:13:00.1] DA: Yeah, straight out of Silicon Valley. So guys I have to ask you honestly, I like you to tell me have I gone too far by trying to apply Scrum to my refrigerator? [0:13:10.1] MN: Yeah, your fridge cannot move those things quite over. [0:13:20.0] DA: Yeah some things maybe. [0:13:21.8] WJ: Sometimes, I think that there are some things that Scrum just really, Agile just really doesn’t need to be involved in. [0:13:27.9] DA: Yeah, I mean I guess it comes back to like the whole Agile manifesto, right? Like that people over process, just in the first one just immediately stop. [0:13:41.8] WJ: Like working software over comprehensive documentation like how do you apply that to your fridge to the fight that you just had with your girlfriend? [0:13:49.8] MN: Well I guess – I could do it. [0:14:09.8] MN: Oh no. Delete that whatever that is. [0:14:13.3] WJ: Well that is why you shouldn’t use – Agile is not for everything. [0:14:16.3] MN: No, Agile is not for everybody. [0:14:16.7] DA: Well it’s for a working relationship over and above the documentation of the fights that we had. [0:14:21.8] WJ: You’re right actually. In this instance the Agile manifesto would have saved you from the terrible documentation. I stand corrected. [0:14:33.5] DA: Yeah but I think that’s maybe where a lot of applications of Agile go wrong, right? You have big companies they are trying to apply Agile as a marketing term and they forget those basic tenants of people who have process working stuff over comprehensive documentation, customer collaboration over contract negotiation, respondent change over following a plan and yes, I do have this in front of me. I do not have this memorized or tattooed. [0:15:02.3] MN: You have that tattooed? No? [0:15:03.1] DA: No, I do not have that tattooed. [0:15:04.8] WJ: He’s just reading that off of Bobby’s back. [0:15:08.9] MN: Yeah, that’s the one on my side. [0:15:10.0] DA: Just a little to the side yeah. [0:15:11.2] WJ: Yeah, it’s got XP explained tattooed on his back. [0:15:17.5] MN: Point two pixel fog. [0:15:19.0] WJ: But then it would be a little painful tattoo to receive. [0:15:20.5] MN: Yes, it would be a painful tattoo. [0:15:22.0] DA: Saying 22 items or something. [0:15:24.0] MN: No-no-no-no. So for those who may feel that we’ve got too far, we realized Agile could be used in some places but not in others. [0:15:33.0] DA: Yeah and I guess the important thing is like if you are trying to apply Agile then it’s not really a process, it is kind of an evolution of feedback loop that you are trying to build to get to a happy state with the thing. [0:15:51.2] WJ: Just go back to the Agile manifesto and try to apply the core tenants. Sometimes the methodology isn’t really going to fit. [0:16:01.3] MN: Awesome, do we have any teach and learns? I think I am going to definitely try again in personalizing my Agile Trello board for personal things. I don’t think I am going to get far though, I really don’t. [0:16:22.3] MN: What is Club House? [0:16:23.2] WJ: Club House is an alternative to Jira. It’s another one of these – I don’t know if you remember Rally or some of the other? [0:16:31.5] DA: Yeah Poodle Lab. [0:16:33.4] WJ: Pivotal Tracker also, a classic one of these ticket management tools. [0:16:40.9] WJ: Jira is sort of the elephant in the room. [0:16:42.0] MN: Yeah, why wouldn’t you use Jira? Jira is the best am I right? [0:16:48.8] MN: I’m tight, you should see my face guys. You should see my face. [0:16:53.3] DA: I think Jira has some good things too but it’s like so customizable you can often paint yourself into a corner. [0:17:00.5] WJ: It’s too big for most projects. It is just too complicated and that I think is the advantage of Club House is that it is simplifies things. It only gives you the things that you actually need and then when you go looking for those things they are much easier to find. I think their area of weakness is that they’re relatively new and they haven’t really gotten that far along in terms of analytics. The analytics are limited. [0:17:26.1] DA: But you know, you could use their API and write a script enclosure. As our good friend of the show, Brian Guther has done before. [0:17:43.8] WJ: Club House all the things. [0:17:44.9] MN: All the things, awesome. Any alternative to Jira, you take some of the good parts from Jira, whatever those things are and then you apply them to all of the applications such as Club House. I imagine there is a ticketing management Agile software for every team that seems comfortable. I have never used Club House before but I am looking forward to seeing how is that different from the others that I have used, the ones you guys explained before. [0:18:11.1] WJ: Yeah the killer feature for me is that you can have two people assigned to a ticket. So if you’re pairing with somebody, you don’t have to pick one person to be on the ticket like you do in Jira. [0:18:20.6] MN: Oh you can’t throw someone under the bus? That is usually what I use it for. [0:18:25.4] WJ: In Jira you have to set up a custom field for the pair and then it just doesn’t track right. [0:18:30.3] DA: Yeah or put in the QA person on there what have you and I think they’ve done a good job at minimizing the amount of clicks that you have to do to get the thing done. So it is pretty useable. [0:18:40.5] WJ: Anybody else have a teach and learn? [0:18:41.9] DA: I continue to learn about GraphQL and I am almost done putting this together, this presentation for the talk that I am going to be giving in PyCon Italia. [0:18:55.1] WJ: Shout out to PyCon Italia. [0:18:59.7] DA: Yeah so that’s pretty exciting and I’m realizing, I’m learning, that it’s a lot of work to put together a talk like two to just like know a thing is pretty easy but then I actually structure knowledge and try to teach people in a constructive way in a limited amount of time is an art. [0:19:18.7] WJ: I am really jealous of your excuse to go eat delicious pasta. It makes me want to make attack. [0:19:27.0] DA: I mean we could just go eat pasta right now if it is too bad, it’s New York baby. [0:19:33.7] MN: Awesome, yeah. Well let’s go I guess. [0:19:36.8] WJ: All right, let’s go get some pasta guys. [0:19:40.1] MN: Let’s keep the conversation going on Twitter. Follow us now on @RadioFreeRabbit. Like what you hear? Give us a five-star review, it helps developers just like you find their way into The Rabbit Hole and never miss an episode subscribe now however you listen to your favorite podcast. On behalf of our producer extraordinaire, William Jeffries and my amazing co-host Dave Anderson and me, your host Michael Nunez, thanks for listening to The Rabbit Hole.